The famous "Number 4". 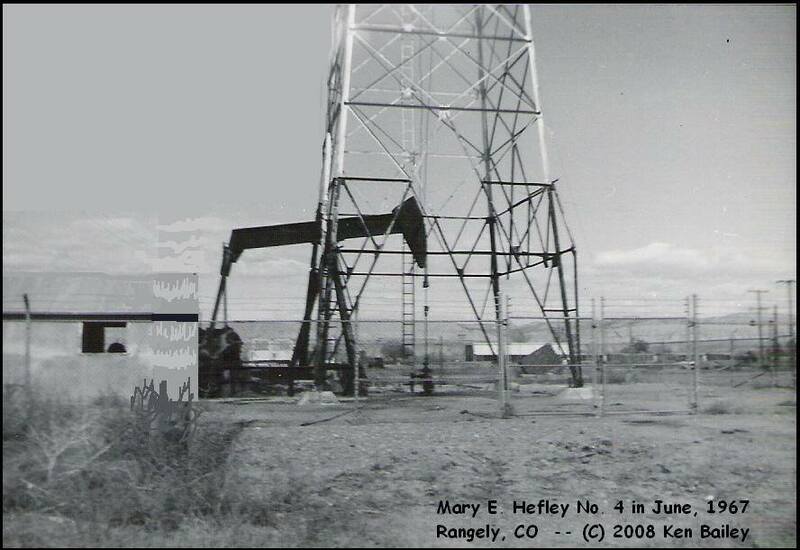 At the corner of Prospect and Morrison Streets was one of the original Rangely deep weber oil wells, Mary E. Hefley #4 -- one of about ten wells in the city limits. "Brought In" in the summer of 1947, she faithfully pumped oil for almost sixty years before being plugged and abandoned. And, she was right down the street from our family home of Cottonwood Drive. Today, as the line from the poem states, she is "a parking lot, where R.V. 's take a nap." Some people fret about living too near oil wells. But, for me, this was part of the experience that made Rangely unique. Mary Hefley #4 in 1967, as photographed by my brother, Scott. Note the "old" Junior High School is the distance, with the white roof. I would pass this well twice a day when walking to and from school. On a spring morning in 1968, Mary Hefley #4 lost her derrick tower. Two years later, the walking beam on her Lufkin pump was replaced with this older one that apparently had spent some time sitting in the mud. The tin Engine House was gone by now, too. Here is a (regrettably blurry) view from the same angle as the previous slide. 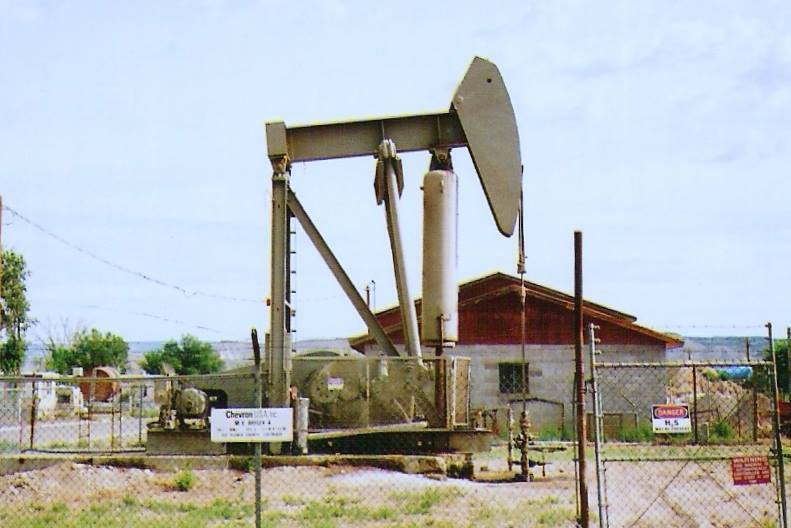 This type of rig -- derrick, pump, tin engine house -- was repeated dozens and dozens of times throughout the field in the early days; Not all wells had derricks, but those drilled by Stanolind (later Pan American Oil) did -- and there were many of them. Note the garages in the background. They are still in place today. Everything else you see in this scene -- except for the hurricane fence -- is gone. Here we see #4 in the winter of 1970-71. The clean horse-head is a stark contrast to the muddy walking beam. If you look carefully, to the right of #4 and forty acres distant, sister well M.E. Hefley #2 still has her derrick tower. Oil wells in the deep field were drilled in a careful pattern like a checkerboard, four wells on the square, and the "forty acre" stuff was measuring diagonally across the square. Here, #4 and #2 and seen looking diagonally across the square; #3 and Cobb-Hefley-Stringer #2, both outside the frame of the picture, complete the square. In the exact center of the square, halfway between #4 and #2, is a newer well, Mary Hefely #5X, drilled in 1969 (the original four were drilled in the later 1940's). 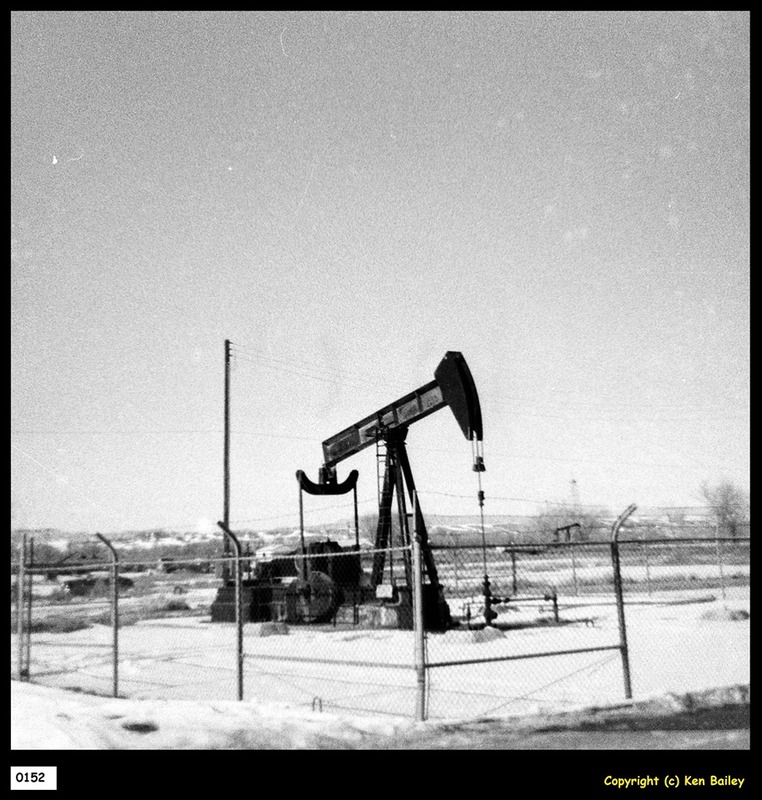 Beginning in 1963, Chevron resumed drilling and added a fifth well in the center of squares all over the oil field. Called, "infill wells" the newcomers had numbers that ended in "X" to differentiate them from the original wells. Within a little over a decade, much of the field had been outfitted with "infill wells" in the middle of the squares. Sometime around 1984, Hefley #4 lost its conventional walking beam pump to a more modern "air balance" variety. The air cylinder behind the horse-head pushed the walking beam up and down and took the place of the heavy, rotating "counterweights" earlier models had used. They came in several sizes; and most of them were much bigger than this compact little guy. Ironically, improving technology led to the manufacturers to overcome earlier geometric obstacles and design bigger "conventional" pumps as the years went by, and, today, "air balance" pumps have become scarce in the Rangely field. By 1996, the air-balance pump on #4 had received a coat of sand-colored paint, mandated field-wide, and a new building was going up behind it to the north, blocking the view of the "old" Junior High School. Today, as the poem, "Ode to a Place That Doesn't Exist Anymore" states, the former site of oil well M.E Hefley #4 is "a parking lot, where R.V. 's take a nap". Note the old garages -- dating clear back to the 1950's -- remain in the background. Somewhere under there is a dead oil well -- cemented solid, welded shut, and dead and buried. R.I.P., Number 4. Ancient HIstory, Cool Events, Did You Know?, Old RangelyKen Bailey August 28, 2017 Rangely, Middle School, Teacher, Book, Dinosaurs, Oil Boom, Prehistory, History, Old Rangely, Ancient Rangely, Ken Bailey, Rangely Museum, Photo Archies, Raven Realty, Out of Print, Until Septmberfest, Get it today!, Get it this weekend!